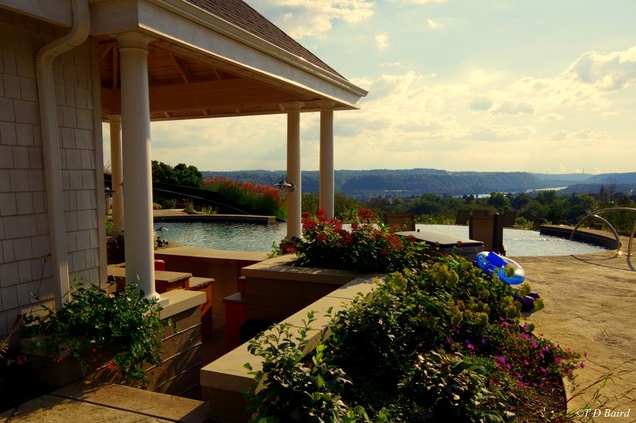 Out in Beaver County, PA, perched atop the hills overlooking the confluence of the Beaver River and Ohio River, this project takes advantage of an impressive view. Party goers as well as rest-seekers can take it all in as they enjoy a drink at the swim up bar, soak in the custom stone spa, peer over the pool’s infinity edge, or slip down the 100 foot long waterslide. 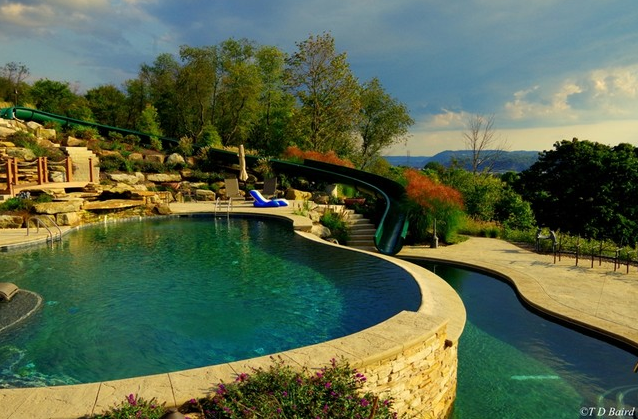 The homeowners’ passion for entertaining fueled the development of a backyard resort. Other features include a children's railroad ride and nine hole miniature golf course along with a well equipped outdoor kitchen, custom natural stone bar and outdoor fire pit. Glacially deposited sandstone boulders were brought in and utilized throughout the project to provide a thematic design element that ties the project’s many features together. An automated LED landscape lighting system and fire pots provide a brilliant nighttime atmosphere highlighting the many unique features of this project and lighting the way for guests.